A large part of the current student-aged population grew up with the works by German children’s book author Cornelia Funke. Inkheart (2003), Dragon Rider (1997) and the Thief Lord (2000) have become beloved childhood classics. They speak of magical creatures, book characters becoming real, and lands that do not exist in this world. Funke seems excited to push the boundaries of fantasy further in her latest series. 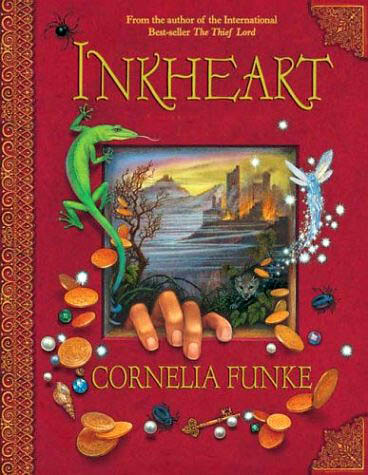 Cornelia Funke’s ‘Inkheart’. Source: Karen Cox on Flickr. Funke joined a mixture of children and fans who had grown up with her work for a short talk, a reading of her latest novel and a question and answer session. Surrounded by the history of thousands of stories in Oxford’s Story Museum, Funke did not focus exclusively on her latest books – the latest of which, The Golden Yarn, was published in the UK last December. She spoke about writing, illustrating, translating and publishing; each answer she gave was well considered before she spoke. Rather than considering herself a ‘writer’, she sees herself as a ‘storyteller’. According to Funke, writers focus on exploring a character’s psyche, whilst storytellers like to create new, imaginary worlds which their characters travel through. She rejected the notion held by many that fantasy as a genre is a way for readers to escape reality, to separate oneself from it. Instead, Funke sees fantasy’s role as helping readers to fall in love with reality. The similarities and differences between fantasy and reality heighten what is good about your own surroundings. Fantasy worlds are far from perfect places – bad things happen in them too, so they cannot provide the utopian escape many think they provide. Even fairy tales with a ‘happily ever after’ ending have dark moments. Cornelia Funke in 2008. Source: Wikimedia Commons. Fairy tales are Funke’s latest fascination. In her latest series, Reckless (also known as MirrorWorld), of which The Golden Yarn is the most recent instalment, the protagonists can visit the worlds which contain our most beloved fairy tales. The fabric between the worlds can be permeated in several places, causing fairy tale plots to play themselves out in our reality. For instance, a girl is put into a coma when she pricks her finger on a magic brooch, echoing the ‘Sleeping Beauty’ tales by Perrault and the Grimm brothers. Although these stories seep into reality, they are localised in their original cultures, meaning that as the characters travel to new countries in each book, the stories and creatures they interact with change. Whilst in Northern Europe they meet creatures from Perrault’s or the Grimms’ collections, in Russia, Central Asia and Japan they are confronted with new sets of stories. According to Funke, fairy tales are a window into the culture in which they are created, a way to understand its fundamental aspects. The audience was interested to know how Funke researches such wide-ranging folklores – does she have to visit the place, or does she just spend a lot of time in libraries? Funke made it clear that location is essential to all of her stories; she considers the setting a character in its own right. Hence, she likes to visit places before she writes about them, stating that experiencing a place leads to better writing. However, she doesn’t need long in each place: she spent only a few days in Venice, in which The Thief Lord is set. She hasn’t yet visited Japan, the setting of her as yet untitled upcoming novel, and wonders if perhaps a visit will change the way she conceives of the folk tales she has been researching. Being an international storyteller means she has met with some issues which she has had to take into her own hands to overcome. Funke writes mostly in German, relying on translators for other languages. Having lived in the US for a long time, she says she has toyed with the idea of writing novels in English, but this would mean someone else would most likely be in charge of the German translation. Having someone else write her books in her mother tongue is an idea that made her uncomfortable. After dealing with a multitude of publishers throughout her career, she describes some as fantastic whilst others were difficult to negotiate with. When one publisher wanted to make changes to her works she did not agree with, she finally decided to create her own publishing house for the US. Breathing Books, whilst not publishing other authors anytime soon, will allow Funke to work on projects and choose the titles her books are published under with more freedom than she has so far been used to. She is especially interested in adding more illustrations to her books, having been an illustrator herself before writing. Funke punctuated her talk with excerpts from her books, and it became clear that she really loves what she does. For a few minutes, the audience was enthralled as she carefully, lovingly read a chapter from The Golden Yarn. Here is a storyteller who wants nothing more than to tell stories, so much so that she is willing to overcome the barriers of tricky publishers to do so.